by Dr. Christopher Chang, last modified on 5/28/18. Given the lack of incisions, patients are allowed to start eating/drinking the day after surgery. Often, patients go home the same day of surgery. A stapler device is than used to divide and seal the cut edges (Slide 11). For more information on why this would help if you are confused, click here. The anchoring sutures are cut and removed. You are discharged after a few hours of observation. If you live far away, you have the option of staying the night in the hospital or at the hotel. By the next day, you are allowed to eat/drink. Post-op instructions can be reviewed here. For a pictoral slideshow of this procedure, go here. 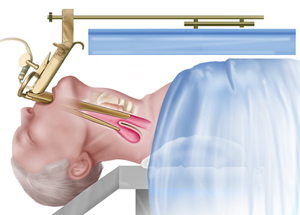 See how this approach compares with other surgical approaches. Click here to watch a video created by Dr. Chang.